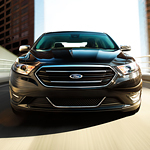 What Technology Features are in the New Ford Taurus? Before you purchase your next vehicle, the crew at Mullinax Ford of Kissimmee wanted to take a moment and highlight a few of the technology features that you will appreciate in this year's Ford Taurus. This full-size sedan will help keep you and other motorists safer thanks in part to features like this. Your Ford Taurus has a way of identifying if it leaves the safety of the driving lane by drifting. If the sensors identify that behavior, the driver is going to be given a serious of alerts, one being that the steering wheel will begin to vibrate in varying intensities until the driver takes corrective action. Even if the driver of the Ford Taurus isn't paying attention, the Pre-Collision Assist system is monitoring the road for a potential collision risk. If a dangerous situation is detected, the system notifies the driver by way of alerts to take action before pre-charging the braking system to bring the vehicle to a stop.